José Alfredo Carrión, born in Santiago de Cuba, began his career as a professional dancer when he was invited to join the Ballet Folklórico Cutumba in 1980 at the age of 17. After only 3 years of hard work, José was recognized as a “primer bailarín.” The following year, in 1984, after an evaluation by a national panel of Cuba’s most distinguished specialists in music and dance, José was honored with the title of professor and specialist in Cuban dance. In 1999, after almost 20 years of being a soloist for the dance troupe, José became Cutumba’s principal dancer. Over the years, multi-talented José has also contributed to Cutumba as a choreographer, percussionist and researcher. José’s choreographies include Guiro para Elegguá, Baile Campesino, Son Tradicional and Fin de Fiesta, which are currently performed together as Fiesta Cubana. He has played percussion in a number of Cutumba productions and can be heard on several recordings including Ritmos Cubafricanos Volumes 1 and 2 which he helped produce. As a professor, José has trained generations of dancers, many of whom still perform with Cutumba, others who continue their work as dancers abroad. Besides teaching professionals, José has a tremendous amount of experience working with children and young adults. He has taught extensively in Cuba’s school system in the primary schools, high schools and universities. José has also brought the joy of music and dance to children with special needs. José has traveled extensively during his years with Cutumba. He has performed and given workshops in many different countries including England, Scotland, France, Spain, Portugal, Italy, Germany, Mexico, New Zealand, Guadeloupe & Martinique, Surinam, Canada and the US. Invited by Chuck Davis to perform in the DanceAfrica festivals of 2002, José had the opportunity to teach in several schools and community centers in Chicago, Philadelphia and NY. 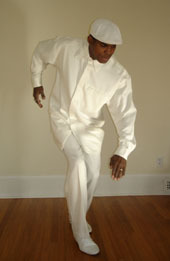 In July 2004, as a guest of Groupe de Danse Mondial of Montreal, Quebec, José taught members of Philadelphia-based Kulu Mele African American Dance Ensemble in an intensive workshop which included an original choreography "Jugando with Elegguá." José has given master dance classes at the Brooklyn Academy of Music (BAM), the Center for Creative Education in Stone Ridge, NY and Columbia College Chicago. Most recently, in October, 2005, he was the artist-in-residency at Williams College in Massachusetts. After 25 years of researching, collecting, conserving, revitalizing & presenting the folkloric manifestations of Afro-Franco-Haitian-Cuban origin found primarily in Cuba's Eastern (Oriente) provinces, José has retired from Cutumba. In April 2005, he moved to Seattle where he and his wife Naomi currently co-direct the Academy of Cuban Folklore and Dance.